The data from Fogo Cruzado indicated that violence has returned to being routine in the favelas of Rio de Janeiro, with or without UPPs. RIO DE JANEIRO, BRAZIL – With the international spotlight on the Carnival celebrations this weekend (February 24th to 28th), and the tourism season in full swing, there may be a lack of attention to the increased violence playing out in Rio’s favela communities. However Complexo do Alemão, in Rio’s Zona Norte (North Zone), is reporting near daily shootings. Violence in Complexo do Alemão has risen to almost daily shootings, photo by Betinho Casas Novas/Jornal Voz das Comunidades. According to a new mobile app call “Fogo Cruzado” (Crossfire), 28 shootings were recorded in the region in thirty days. The app, which was launched in July last year, allows any resident to share data in real time every time they witness or hear a shooting. According to the app, from February 7th to 13th, Complexo do Alemão reported eleven firefights in six days. Last week was quieter, between February 14th and 20th there was no record of confrontation. Yesterday, however the Carnival peace was broken with more gunfire, and according to the Police Pacifying Unit (UPP), military police (PMs) were attacked in Largo do Samba, in the Nova Brasília community. 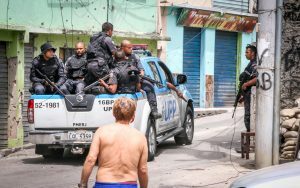 The month of February has been violent from the start in Complexo do Alemão. Local news outlet O Globo reported that 3,000 children were stopped from going to school because of clashes with police and traffickers that broke out exactly on the day of school, February 2nd, mainly in the areas of Alvorada, Nova Brasília, Casinhas and Fazendinha. The Voz das Comunidades new outlet reported that in addition to bullet holes scarring the walls, windows and cars of the community, residents reported break-ins, invasions and thefts by the police forces. The situation has worsened in recent days, as PMs stormed houses and turned them into bases in the war against the traficantes. President of the Human Rights Commission of the Rio section of the Brazilian Bar Association (OAB) Marcelo Chalreo said he would ask the state prosecutor to investigate the situation. Fogo Cruzado’s data indicates that violence has returned to being routine in the favelas of Rio de Janeiro, with or without UPPs. Public security expert Roberto Kant de Lima, a doctorate in anthropology at Harvard University and professor at UFF shared his disappointment.